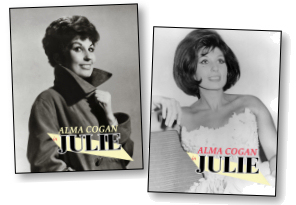 Stage Door Records in association with Carole Foster and the Official Alma Cogan Fan Club are proud to present on CD for the first time the musical 'Julie' starring Alma Cogan. This release will not be available in any stores. 'Julie' is a musical with book, music and lyrics by Stan Foster. With an exotic setting in the Far East, the story tells of Julie Knight a celebrated singer who travels to the region to entertain for the troops only to get caught in a web of espionage and ultimately falling in love with the nation's leader. 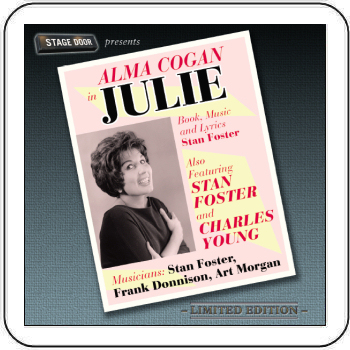 The show was written for Alma Cogan who along with Stan Foster and Charles Young recorded a concept album of the score in the early Sixties for prospective theatre impresarios. This strictly limited edition pressing of 'Julie' presents Stan Foster's lively musical score in its entirety for the first time and has been restored from Stan's original archive tapes. All orders are accompanied by two unique glossy collectors postcards depicting Alma in a typical glamorous pose. The reverse of the postcards feature newspaper articles from the early sixties on Stan writing 'Julie' as a musical vehicle for Alma.